VANCOUVER, British Columbia, May 15, 2012 - Flowfinity Wireless Inc., a proven provider of enterprise mobile apps for business process automation, today announced a software solution that helps contractors, architects, and builders gain efficiencies and ensure projects are completed on time and on budget. The solution allows day-to-day tasks to be automated on smartphones and tablets, reducing paperwork and manual reporting while providing information flow to and from the field. With Flowfinity, teams in the field can capture data for submission into a central database, and access enterprise information from wherever they are. 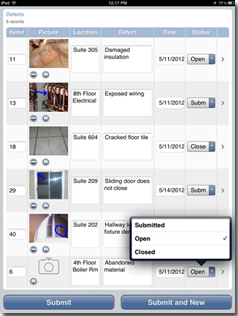 Fully customizable forms, requests and documents such as site surveys, inspection reports, punch lists, and incident reports can be completed at the job site on a smartphone or tablet and submitted back to head office in real time. Tools for collaboration provide streamlined communication between contractors, consultants and other project stakeholders. RFIs, submittals, change orders and approvals can be accessed immediately, resulting in shorter cycles and better documentation. Managing teams and tracking costs is also more efficient with mobile scheduling, dispatch and time and materials reports. Timesheets and materials lists can be completed on a mobile device at the time of work instead of after the fact for faster, more accurate job costing. "Flowfinity has a unique solution that delivers more efficiency, timeliness and accuracy in managing construction tasks and teams," said Larry Wilson, VP of Sales and Marketing, Flowfinity. "The result is that the solution not only reduces delays and total time spent on a construction project, but also provides an audit trail with thorough documentation of the project." For more information about Flowfinity solutions for the construction industry, visit Construction Project Management Solutions. Flowfinity provides a proven, fully customizable solution for building enterprise mobile apps without programming. Since 2000, Flowfinity has helped leading companies across industries empower their mobile workforces in order to enhance productivity, engage management, and improve business insight through all areas of the organization. By making it easy and fast to mobilize day-to-day business processes on tablets and smartphones, Flowfinity enables mobile teams to access, report, and share information when and where they need to. Top global brands in CPG and other industries rely on Flowfinity software as the standard technology for automating critical business processes.